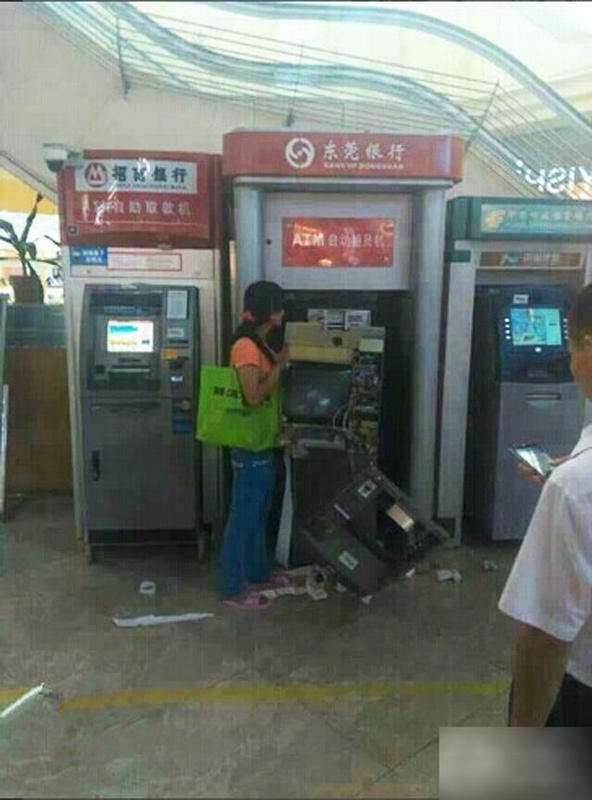 Recently, many Dongguan residents have seen a post in their Weixin/WeChat Moments [friend's circle]: A woman in Shilong town who apparently couldn’t withdraw money angrily dismantled an ATM machine with her bare hands. 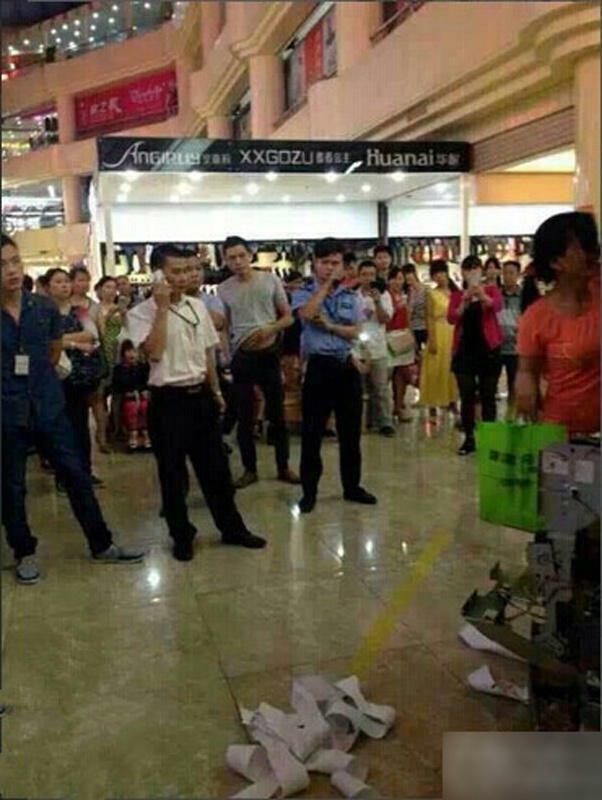 As this reporter learned, this scene indeed happened on October 16th inside the Jinshawan Shopping Mall. Shilong Police state that they preliminarily suspect the woman suffers from mental problems, have already taken her to the Dongguan Mental Hospital for examination, and are awaiting a diagnosis before they process the case further. As for the bank involved, they have yet to issue a clear response regarding this matter. 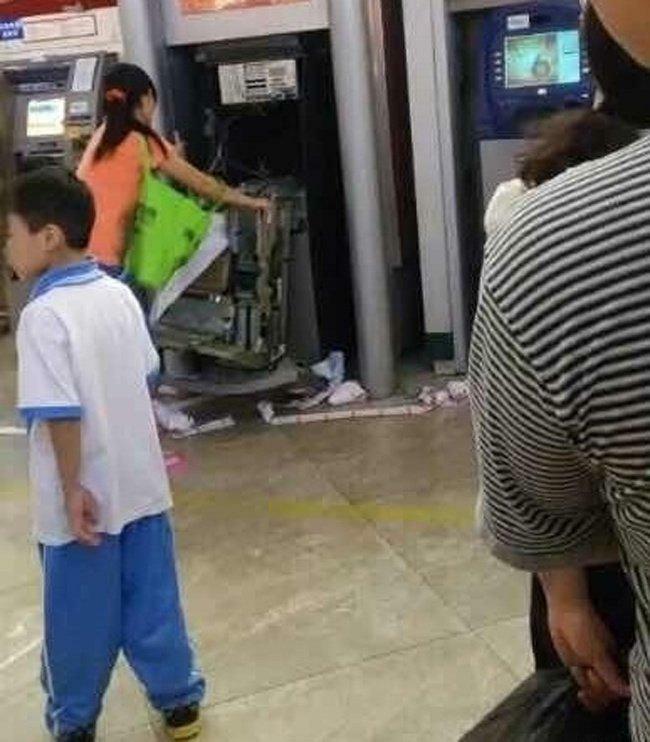 As seen in the photos online, the woman stands in front of a damaged ATM, with the ATM computer display “ripped out at the root” lying on the ground, and large amounts of receipts scattered on the floor. With a large number of city residents looking on at the side, there were even some security guards at the scene maintaining order. A relevant representative of the Shilong Jingshawan Shopping Mall loss prevention department told this Southern Metropolis Daily reporter that at around 5:50pm on October 16th, this woman arrived at the ATM next to the escalator. 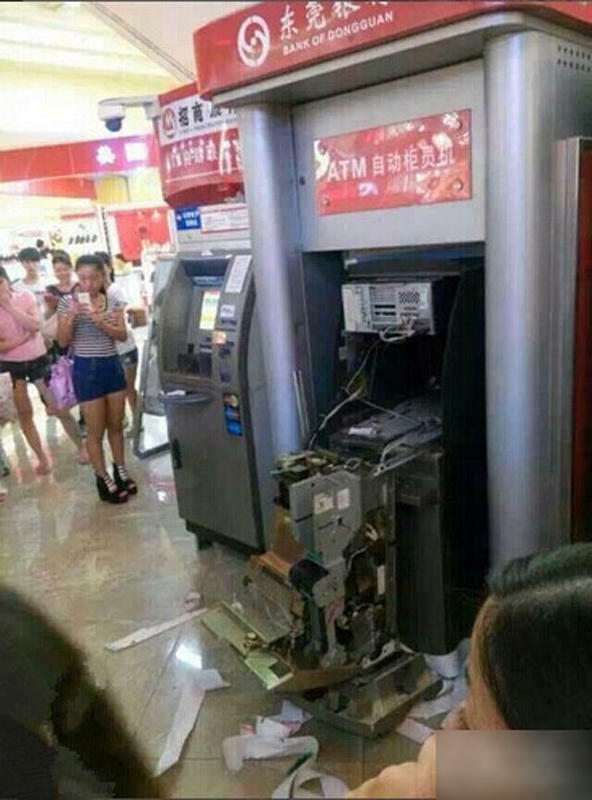 “Afterward, we seen from the surveillance footage this woman dismantle the ATM, with security guards being dispatched to the scene after reports, but she had taken the ATM apart within a short few minutes,” the representative said. At the time, the woman stood next to the ATM mumbling to herself, pounding on the machine every so often. 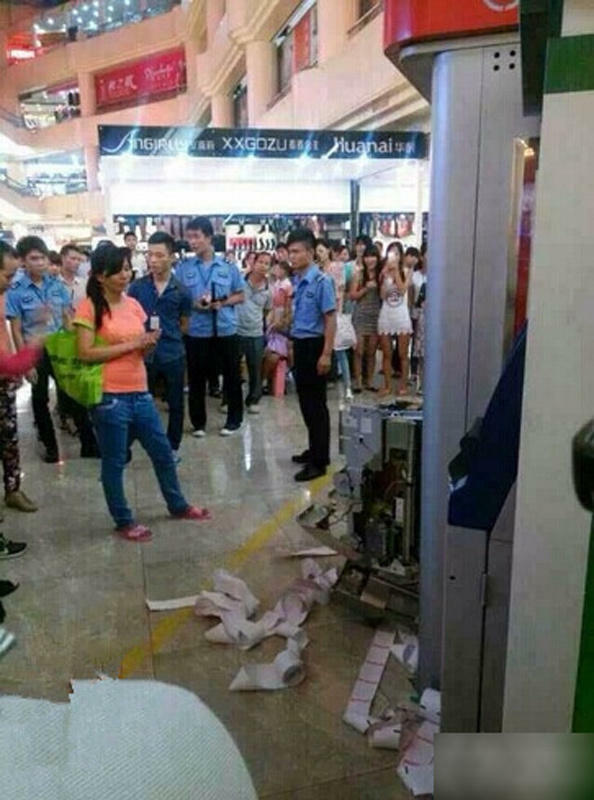 “After dismantling the machine, she even stood there as if nothing had happened, but was then taken back to the police station once police arrived,” the representative said. At the time, the woman’s manner of speaking and bearing both seemed not quite normal, so employees did not go forward to stop her, and only called the police as well as notify the bank to come and deal with the situation. 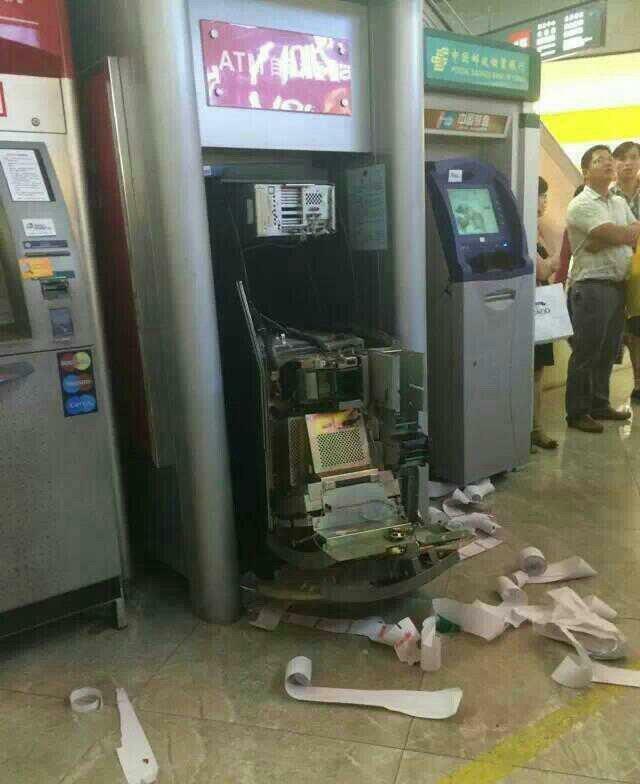 The representative says it may be that this ATM has been in service for too long, and that the plastic casing surrounding it has become old and brittle, and was therefore easy to damage. Through police investigation, the woman is surnamed Lin, is from Guangxi province Nanning city, and is 28 years old this year. At present, The Xihu police station has already sent her to the Dongguan Mental Hospital for examination. Because it will take 15 days before the hospital can produce a relevant assessment report, the woman is currently under observation and treatment at the hospital. Police are awaiting the hospital’s detailed report before they will continue processing the case.